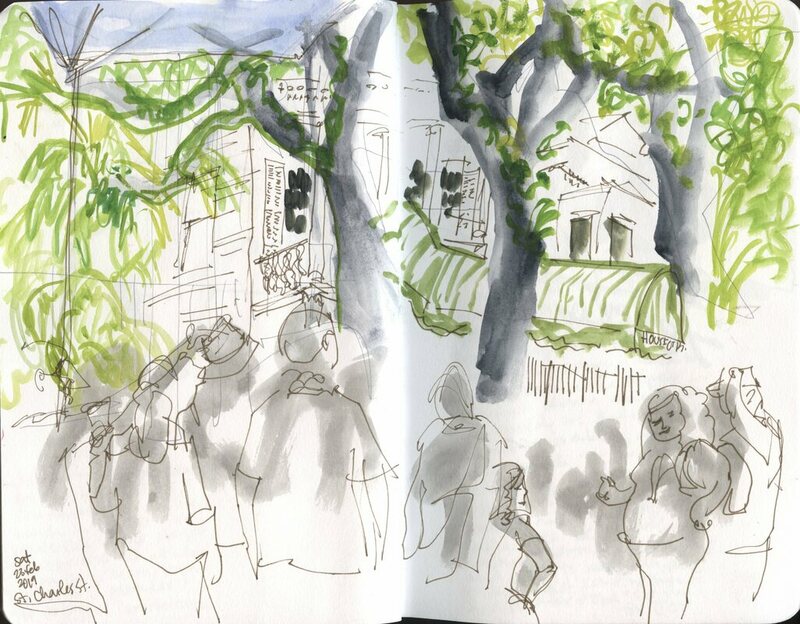 I've been following a hashtag on Instagram, #walktosee, started by British illustrator Helen Stephens to showcase drawings of daily walks. 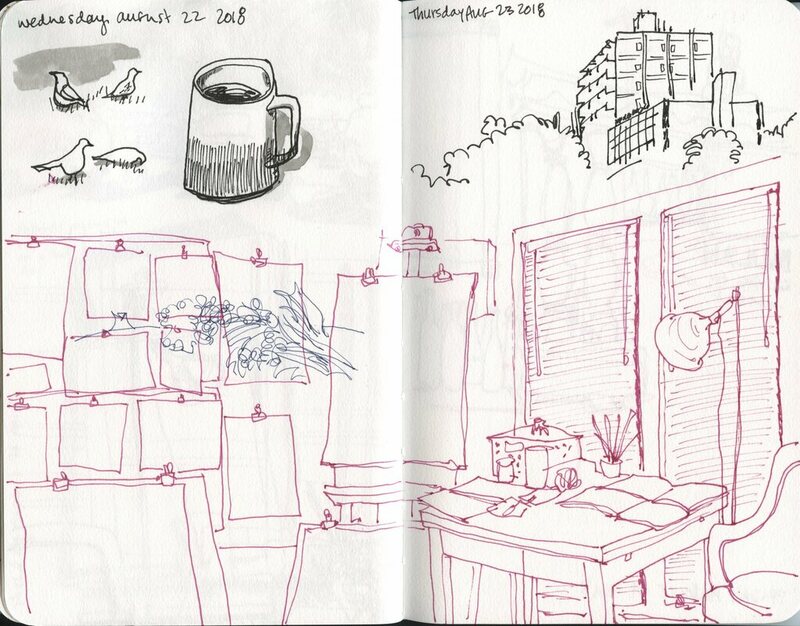 It has inspired me to walk with my sketchbook more, though mostly it's just been around the Dixon Gardens (not that there's anything wrong with that). But it's also just very inspiring - for a social media hashtag, the posts are consistently good and I have learned so much from everyone's sketches. 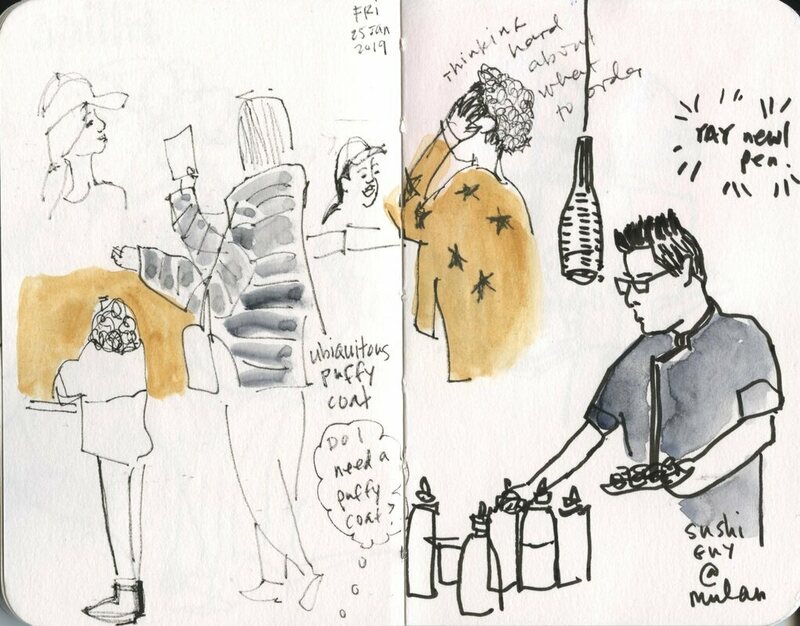 There are a number of other British illustrators who use this hashtag and there is this consistent feeling I get from these sketches that inspires me to slow down and to really enjoy the moment. Also they inspire me to use colored pencils! That's what I did today when I went out looking for an open restaurant to order lunch. 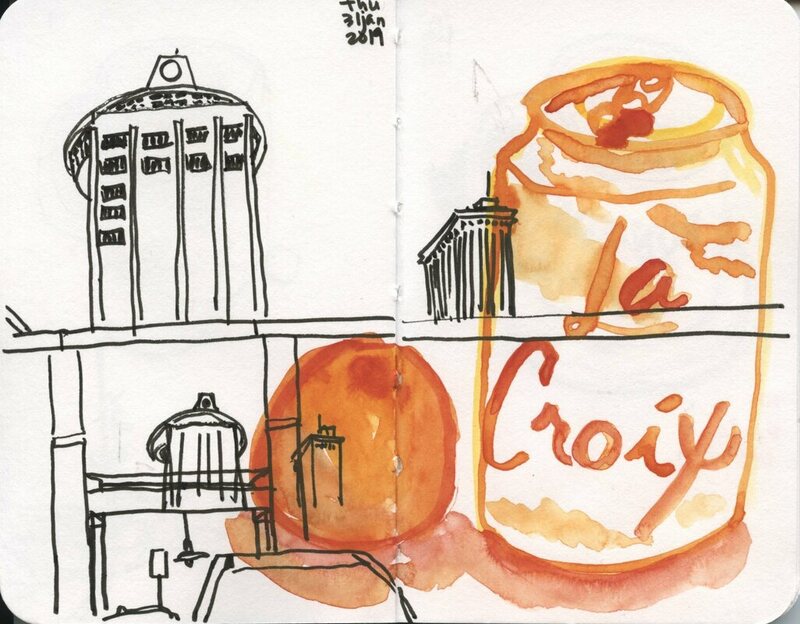 I saw that Casablanca was open so I pulled into a good parking spot (yes, I was driving, not walking) with a view of the Clark Tower, called in my order, and spent 15 minutes sketching this. 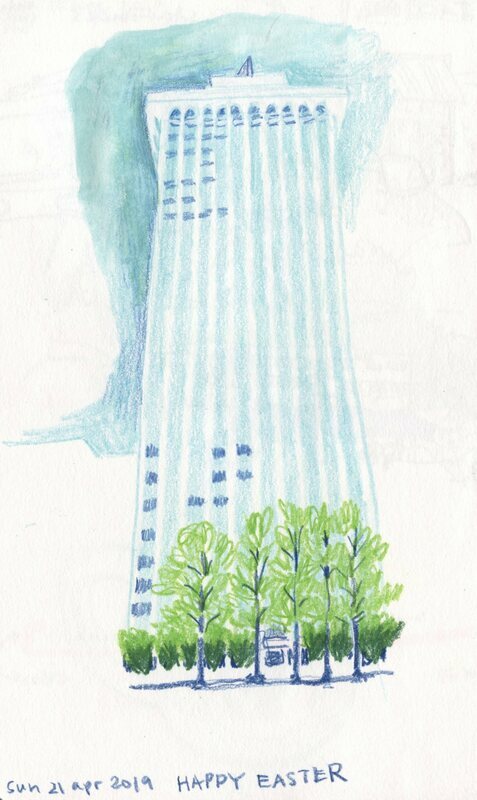 After I got home I added a little white gouache, but you can't really see it in this scan. You should follow along, and even post your own! 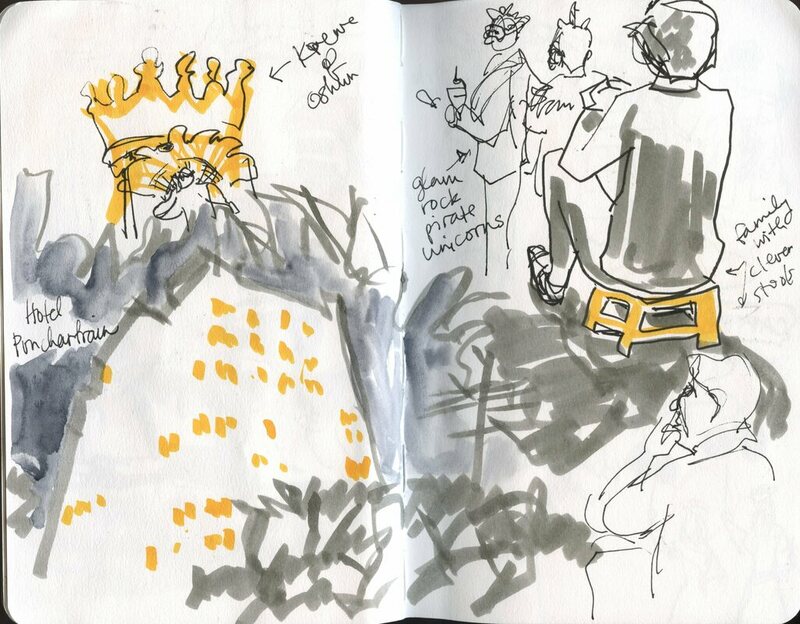 Helen features #walktosee drawings each week or so in her Instagram stories - she's on Instagram as @helenstephenslion. 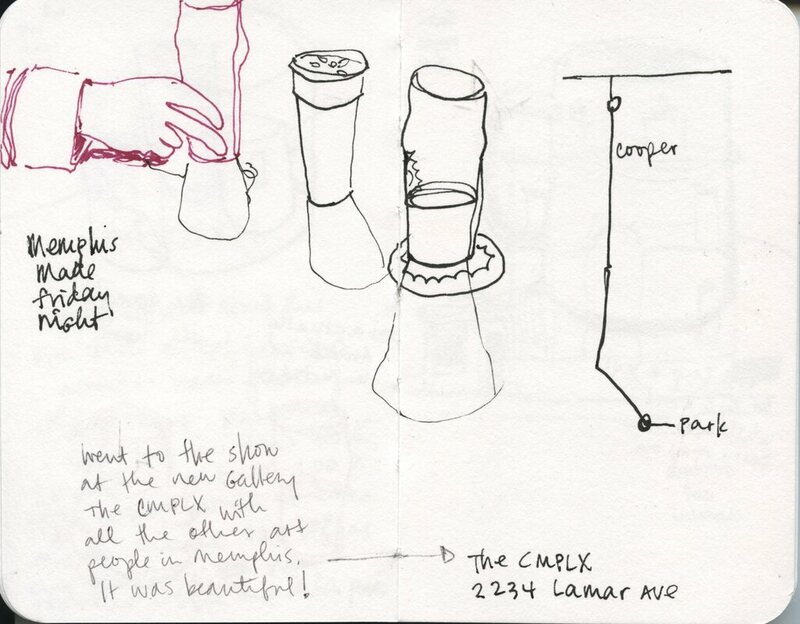 The Dixon Gallery and Gardens is showing work by Memphis Urban Sketchers now through July! "First Saturdays" (because we meet on the first Saturday of the month - get it?!) 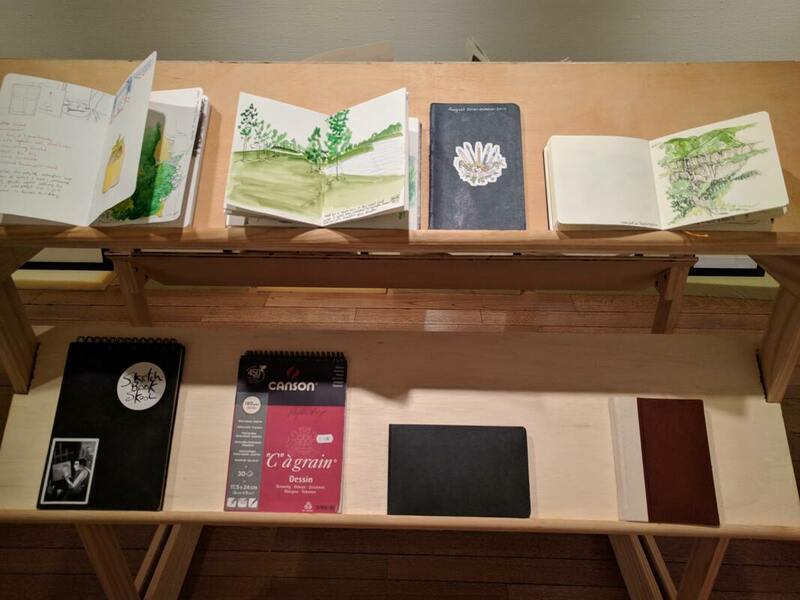 shows work by over 20 local sketchers - framed work, sketchbooks, and scanned work displayed digitally as a nod to the Internet-only beginnings of Urban Sketchers. Go see it - it's delightful! 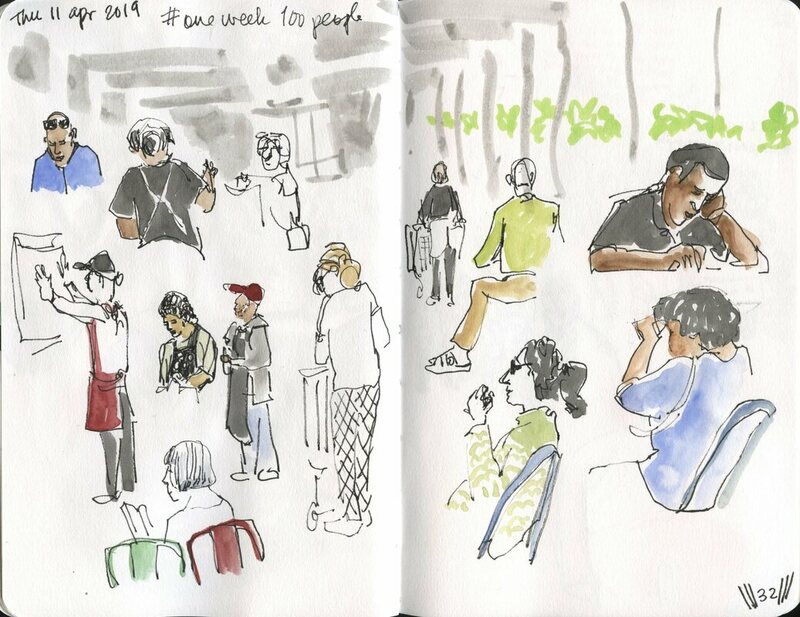 ​Last week was another round of #oneweek100people, an annual challenge to sketch 100 people, started by Marc Taro Holmes, Suhita Shirodkar, and Liz Steel. Sketchers set their own parameters, usually things they want to work on, like starting with watercolor or using a particular pen. Once again I did not get to 100, but I'm okay with that. It was a weird week and I was just grateful to have a reason to make time to sketch. 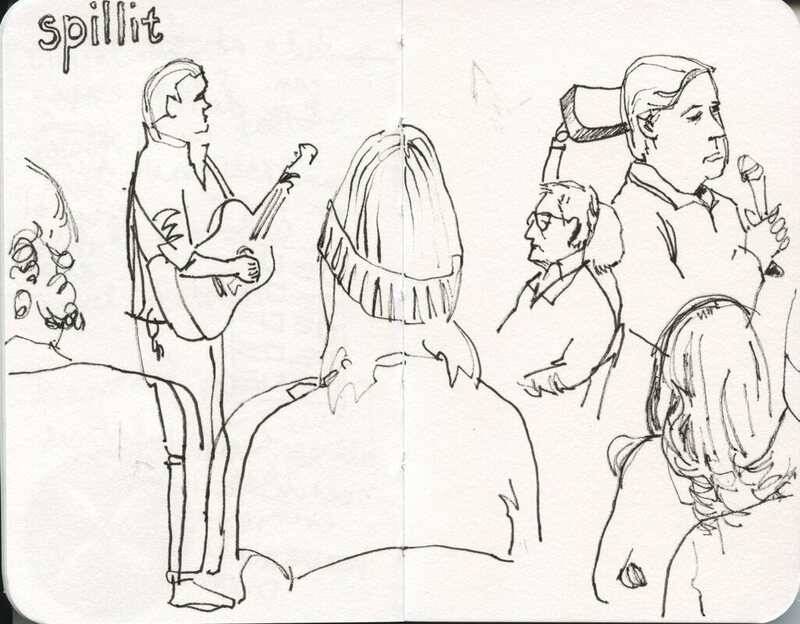 My approach was to get information using very few lines, so I used my favorite Pigma Graphic 01 (my "fat pen"). 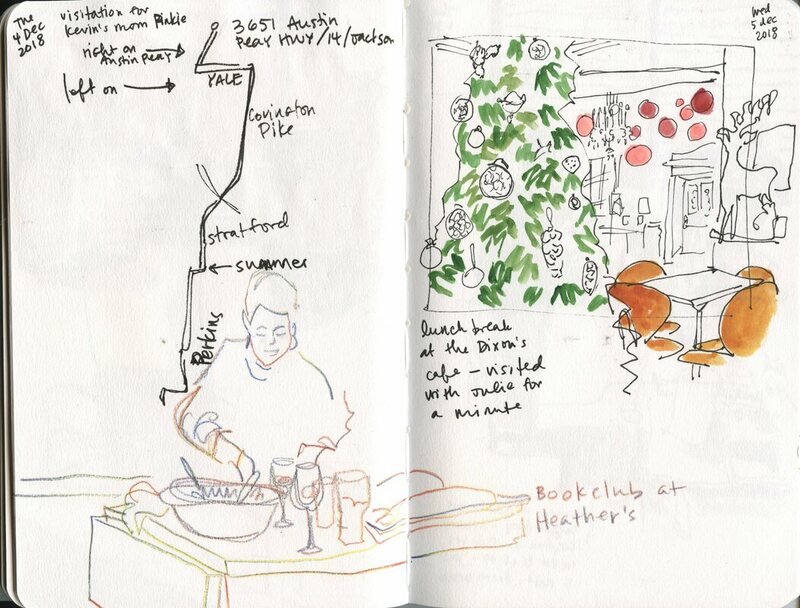 ​In the middle of the week I had a sketching dinner with Christina Huntington and Martha Kelly. What a treat! 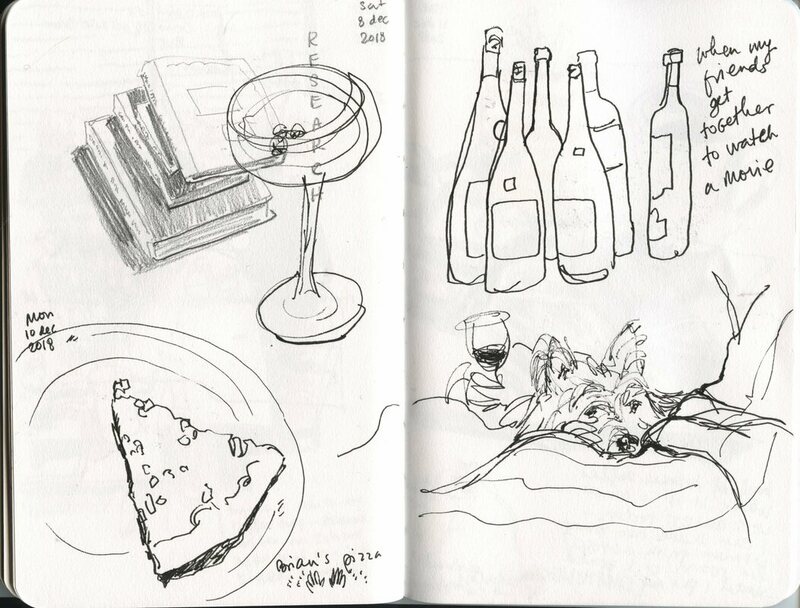 I didn't draw them to add to my 100 people, though - the items in Christina's house were too interesting to not sketch. ​One day I had the time to add watercolor and I'm really happy with how those turned out. 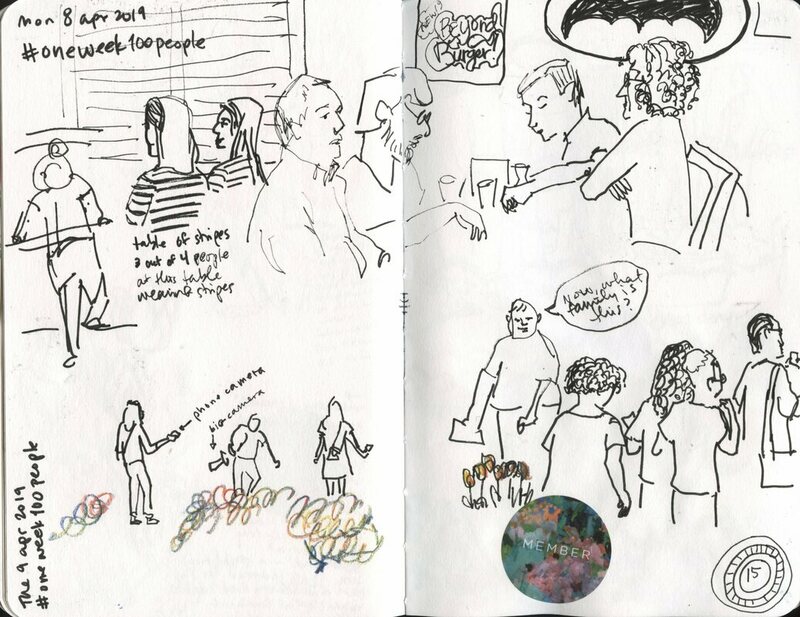 On Friday I had lunch at the Dixon and sketched a few people in the cafe with my HI-TEC-C Coleto multi-pen - that's always a fun way to draw people. When I left the museum I saw this long line of people waiting for a food truck and I figured that was my opportunity to make it up to 50. 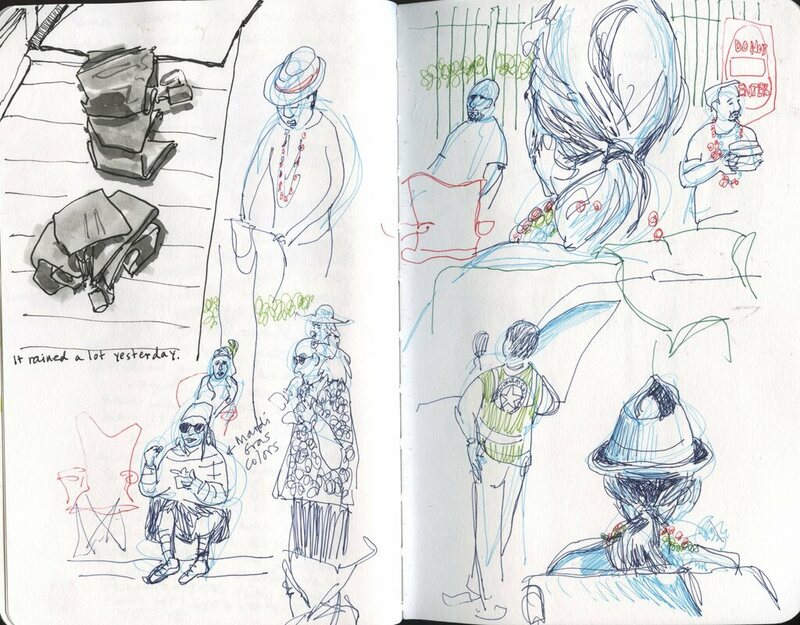 ​I do love this challenge - it always reminds me how much I enjoy sketching people and I end up sketching people more when it's over. 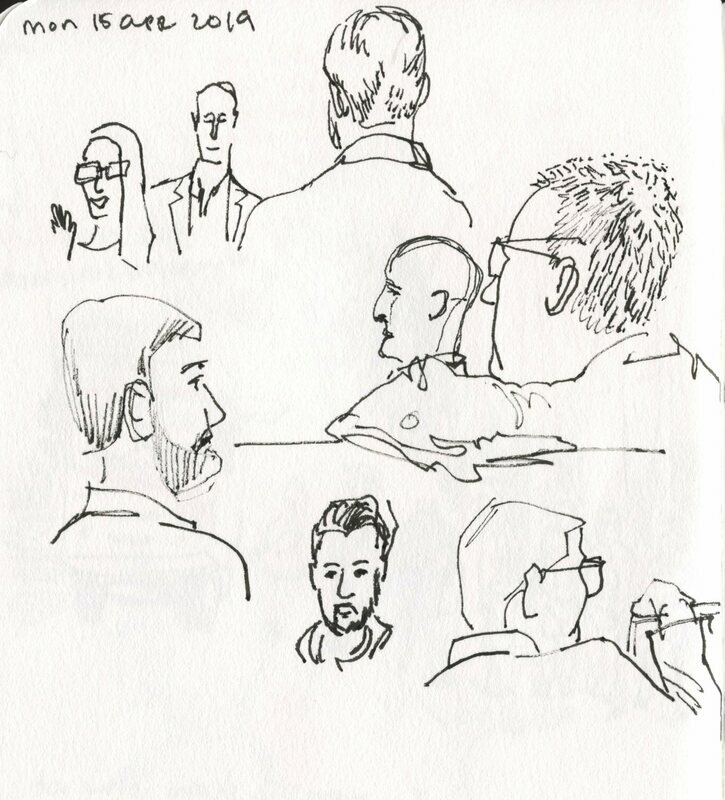 On Monday morning I sketched people in a meeting! 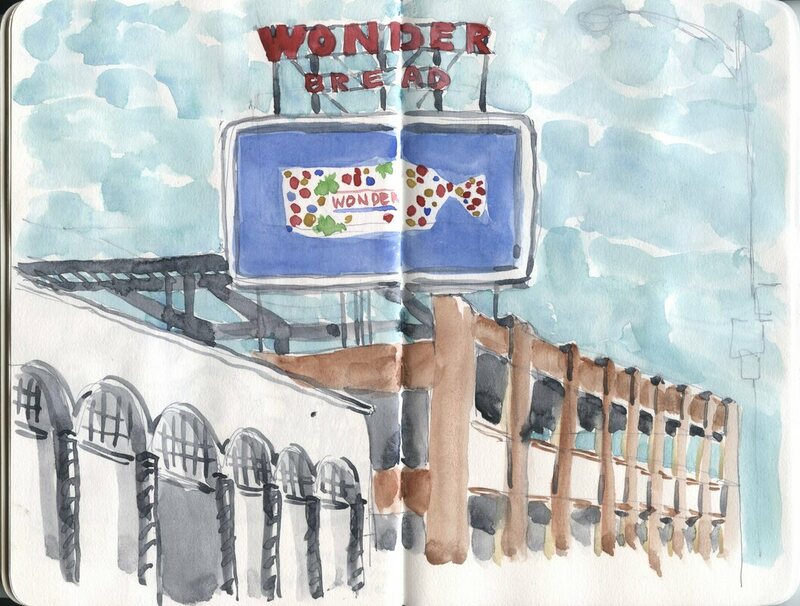 ​I went to New Orleans again, with some of the best people, as usual, for pre-Mardi Gras Mardi Gras. We like to go a couple of weeks before fat Tuesday because it's just as fun but slightly calmer and slightly less expensive. 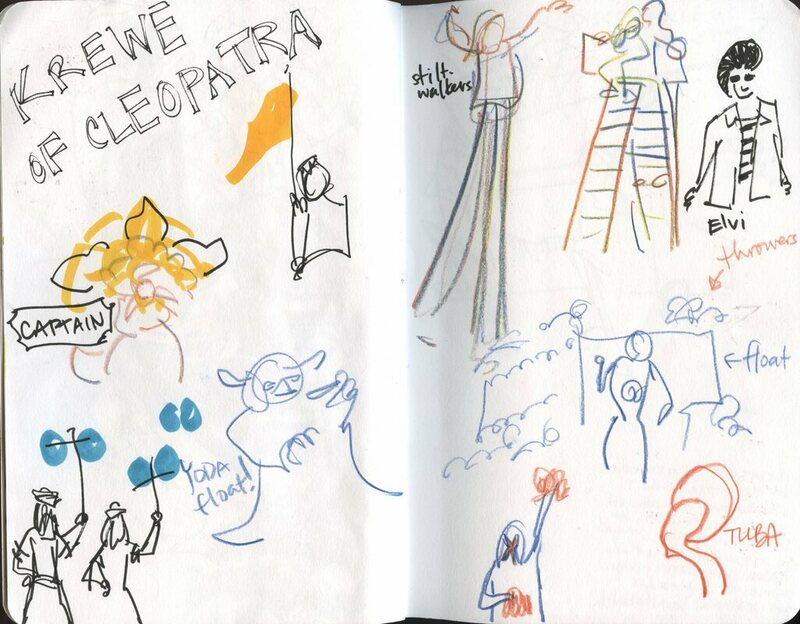 ​Sketching at the parades is fun, but I struggled with what supplies to use. 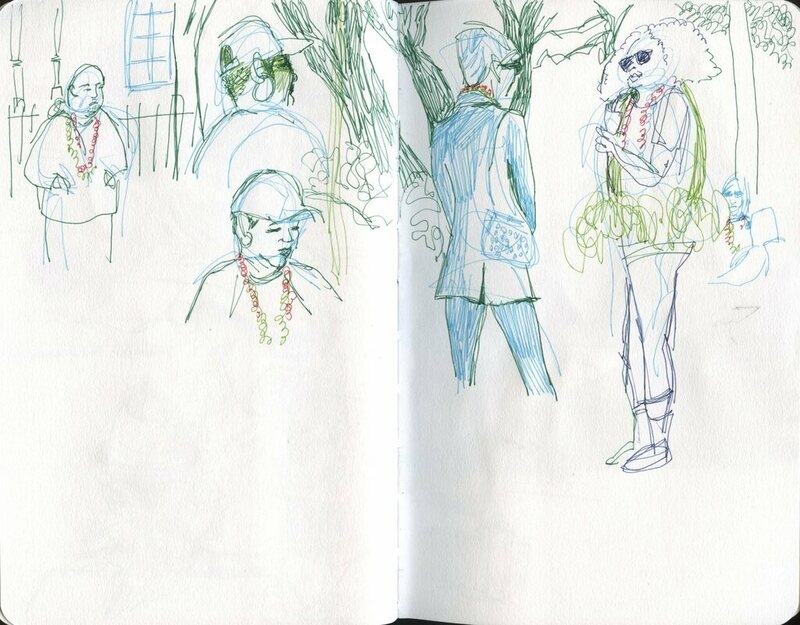 The activity of the parades requires sketching quickly, but it also feels important to differentiate people from background, floats from bystanders, etc. So I would end up holding several pens and colored pencils, but didn't feel satisfied with my results that first night. 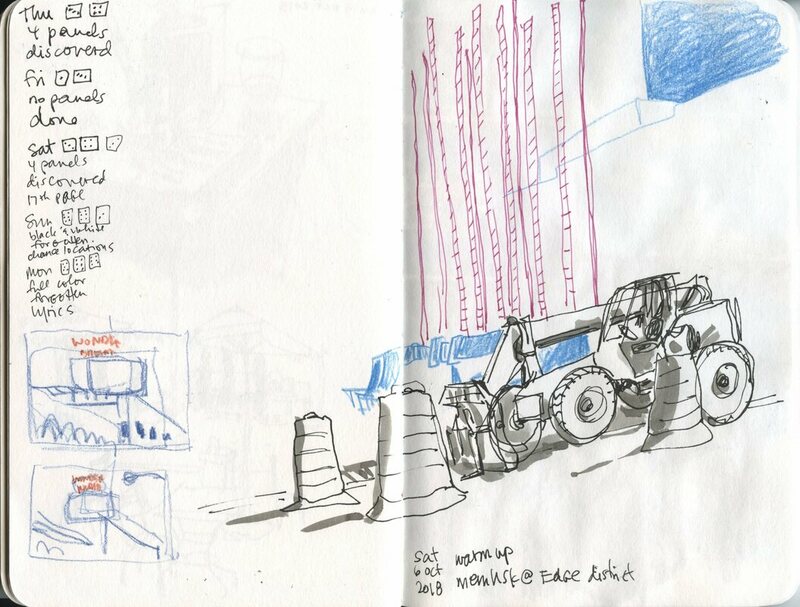 ​On day two I remembered my multi-pen (HI-TEC-C Coleta with 5 colors). 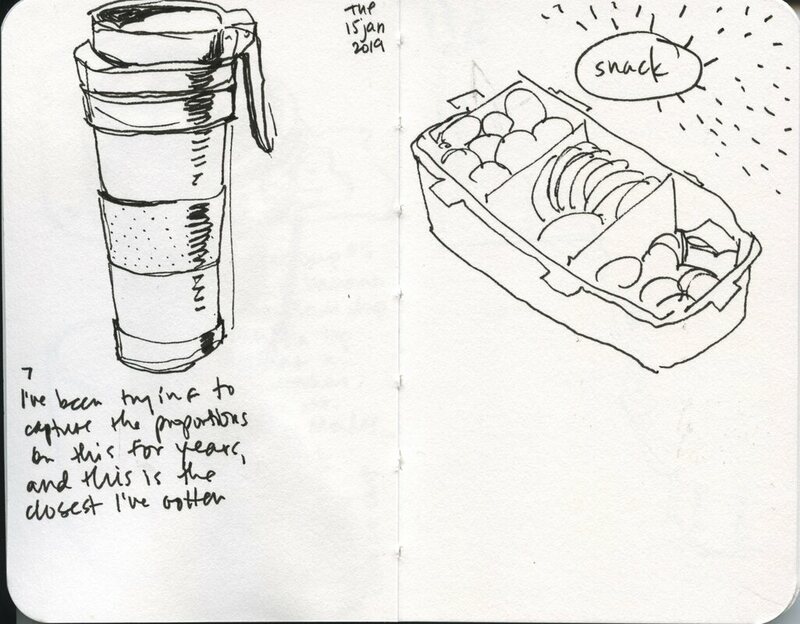 Though I used to sketch with it often, it had fallen out of rotation. Luckily, I always carry one in my purse! 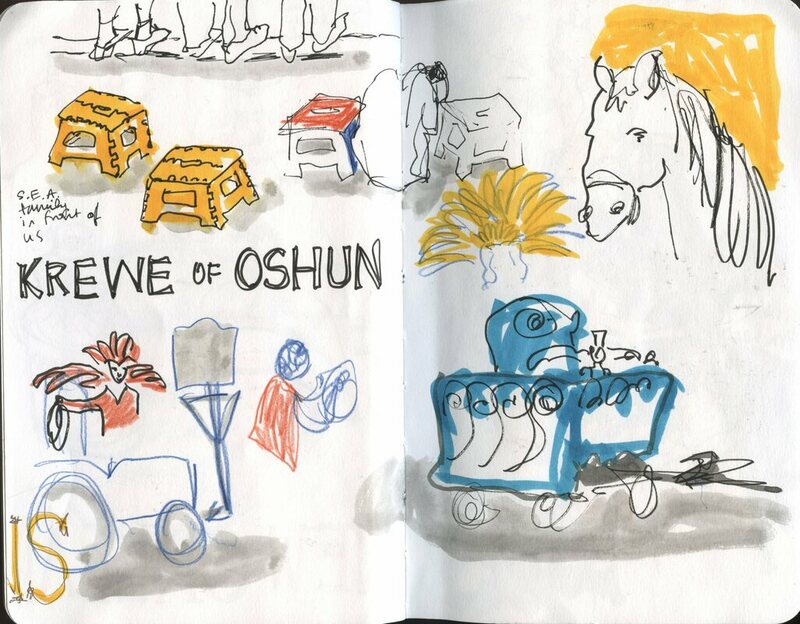 I had a great time sketching with it, just clicking from color to color and really playing up the scribbles. I quickly ran out of blue-black! When I came back home I ordered every color available, and I now carry several multi-pens in my purse. I'll need some kind of holster for them next year! 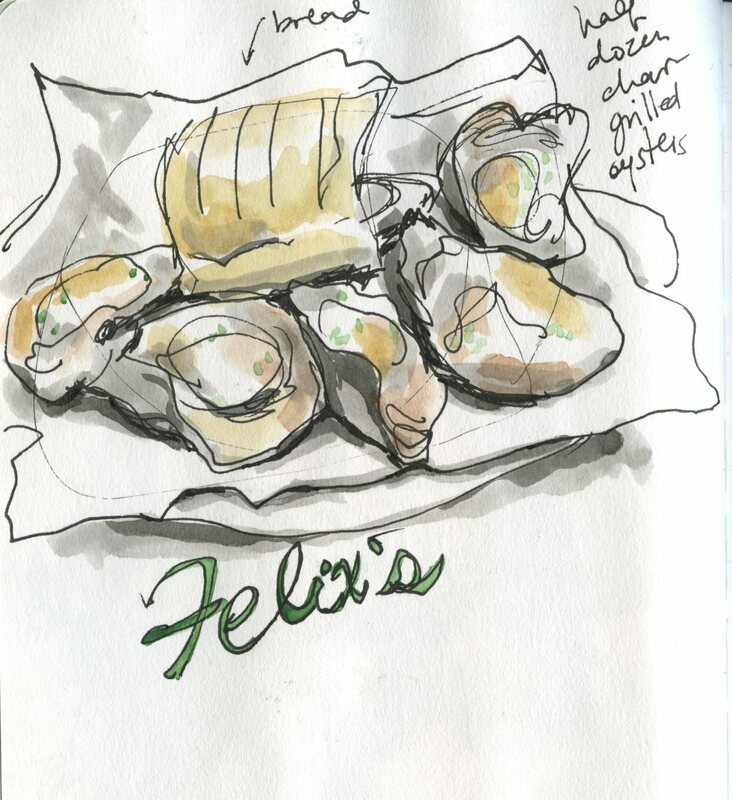 ​Went to Felix's, or course. We stayed in Uptown in a house a block from Magazine Street. This church was catty-cornered to where we stayed. 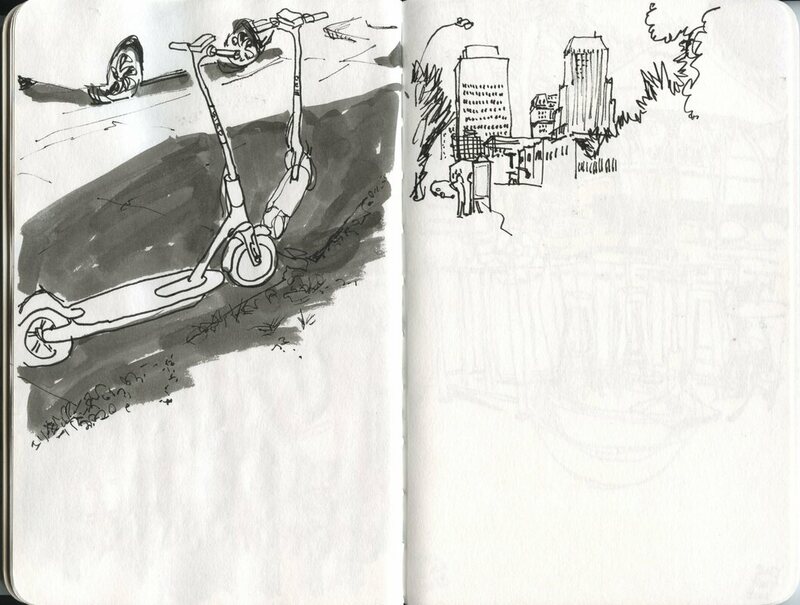 I put down the color first, then added ink with my Lamy Safari and carbon black ink. 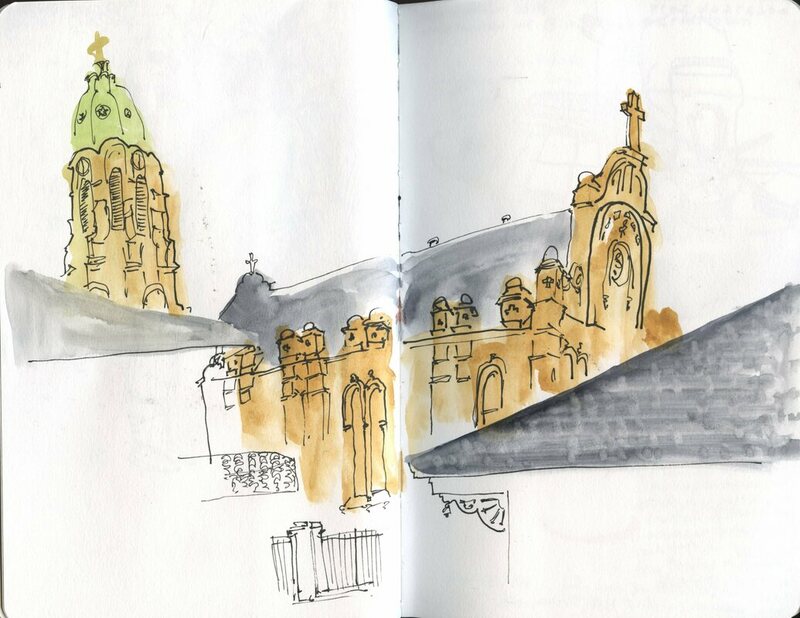 There were at least two other churches we could see from our porch, so we heard a lot of church bells. I feel like I didn't sketch as much this time, but I think I always feel like that. I also always feel like it is over too soon, and this year was no exception. In my last post I wrote about not feeling like sketching because I was a little under the weather and then my body was like - You think that was bad, watch this! - and I came down with a sudden cold that quickly turned into an upper respiratory infection and ear infection. So while the previous sickness had me feeling down because I was tired, this one had me in bed on several prescriptions, binge-watching the Lord of the Rings movies. 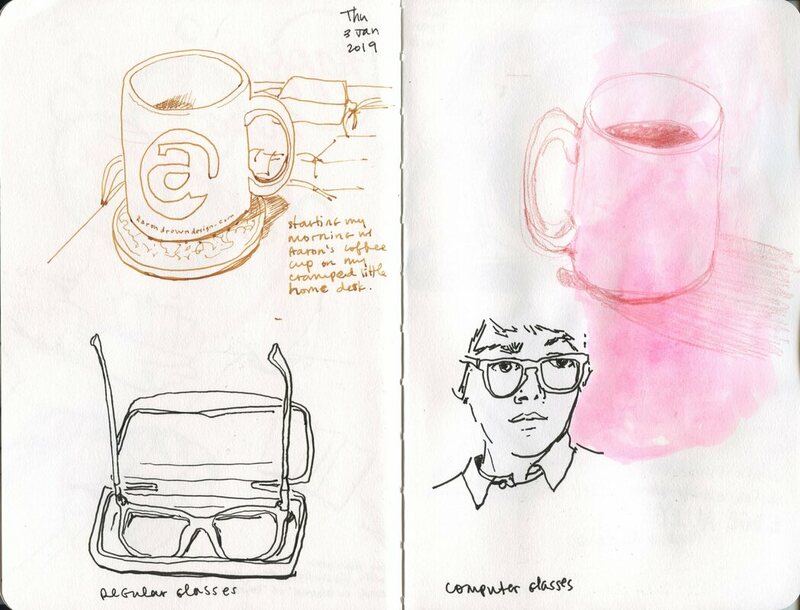 Finally yesterday I picked up my sketchbook and recorded all of the things that helped get me through the last week and a half. Well, these things and my husband, who has taken excellent care of me even though he caught the cold-only version of what I had. Also not pictured: lots of kleenex. 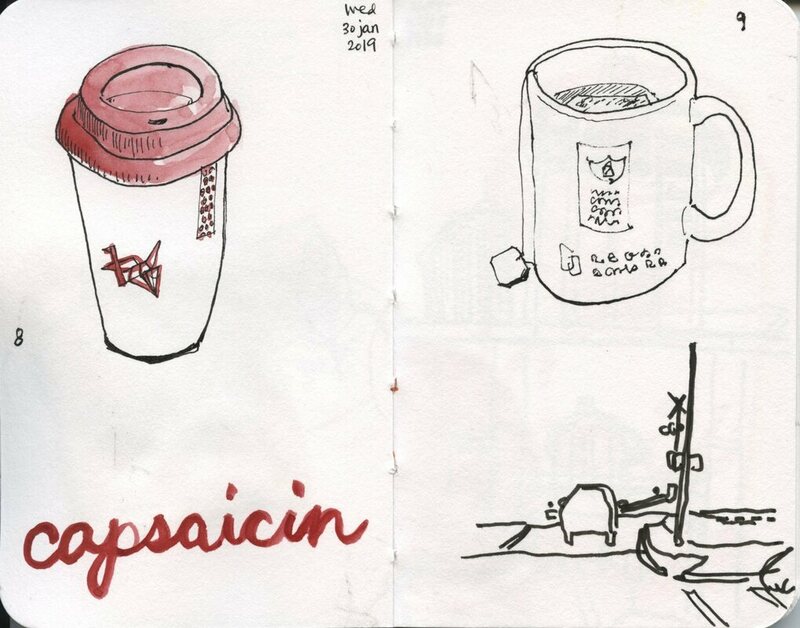 To start, here are the last few sketches from my previous sketchbook, a Stillman & Birn Alpha 8.5 x 5.5. This has been my go-to lately and I love it. 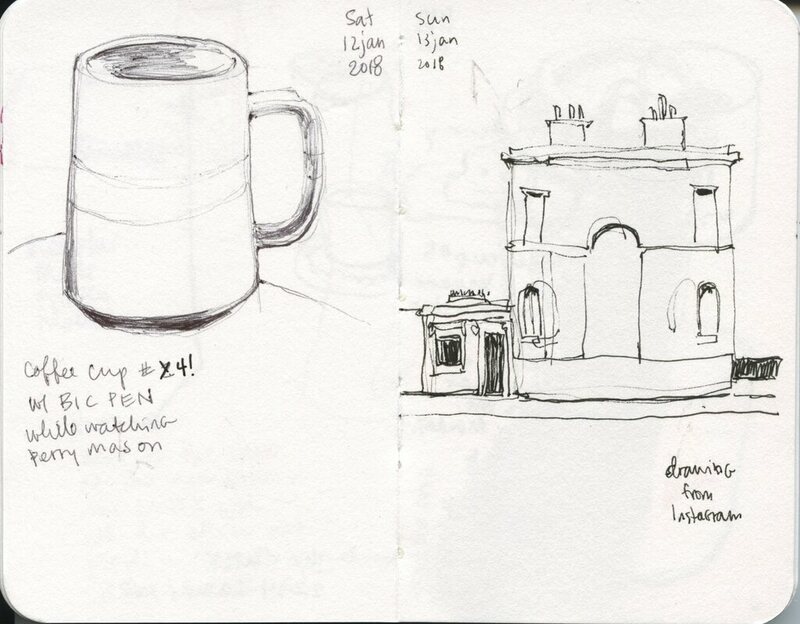 When I completed that sketchbook, I switched to the Stillman & Birn Alpha 5.5 x 3.5 - considerably smaller! 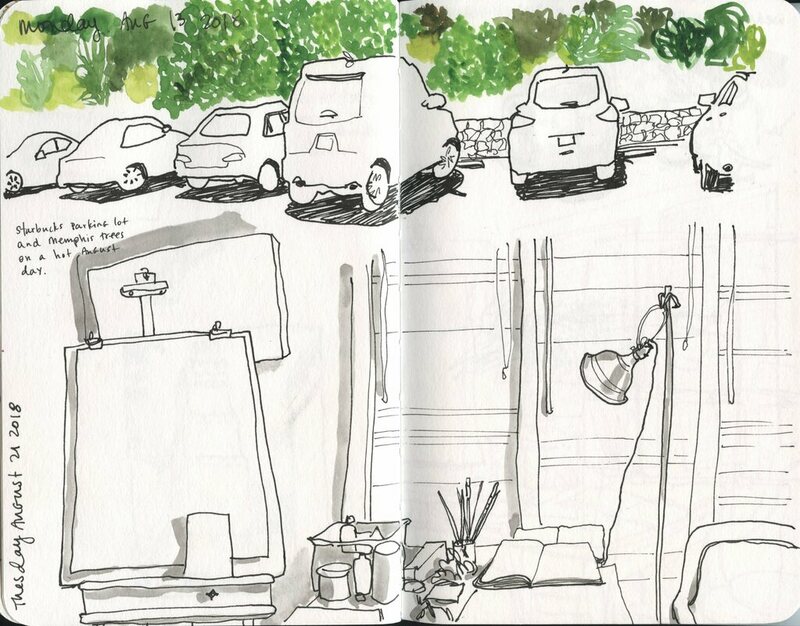 I've been inspired lately (and always, really) by Gabi Campanario's work in this size sketchbook (see his site here). 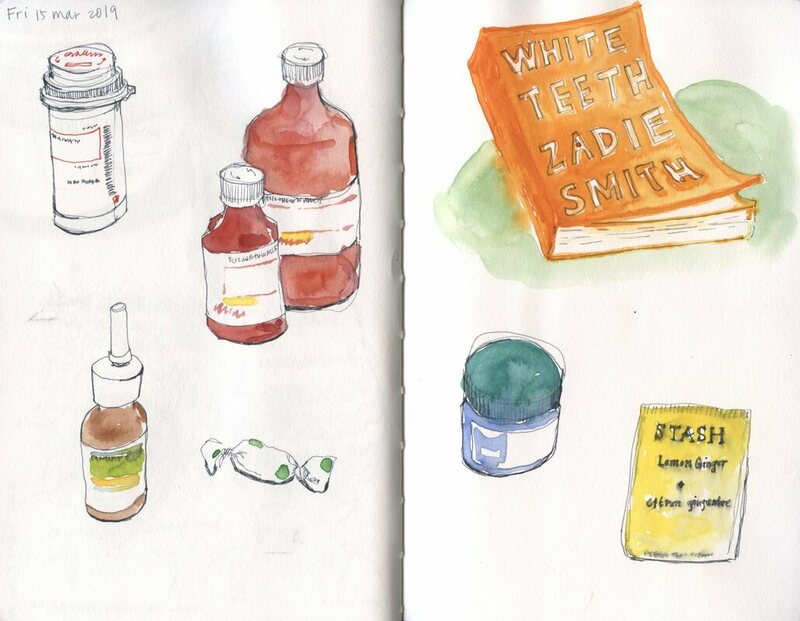 It is good to mix up your sketchbooks, sketchbook sizes, and materials sometimes. Liz Steel just posted a great article about this very thing! You can see her article here, and you should just read as much as you can while you're at it. 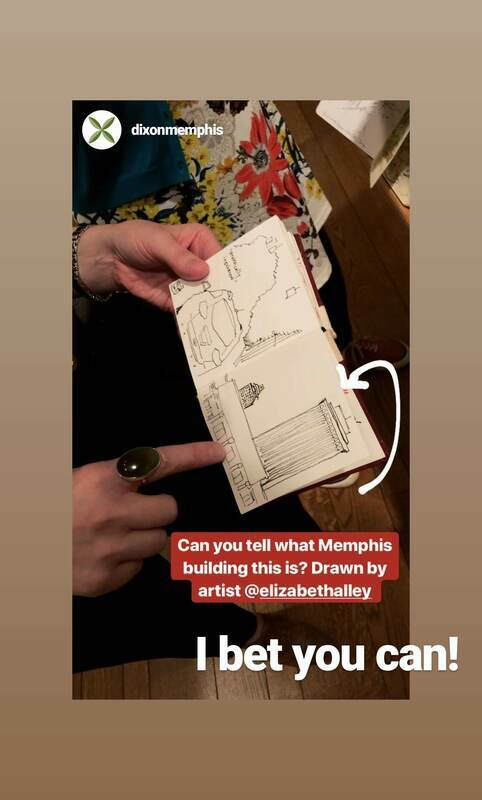 Liz is very analytical about her sketching choices and very generous with sharing her insights. Even though I've used this size several times before - I even took this size to Paris a couple of years ago (see sketches here), I was struggling with the change. 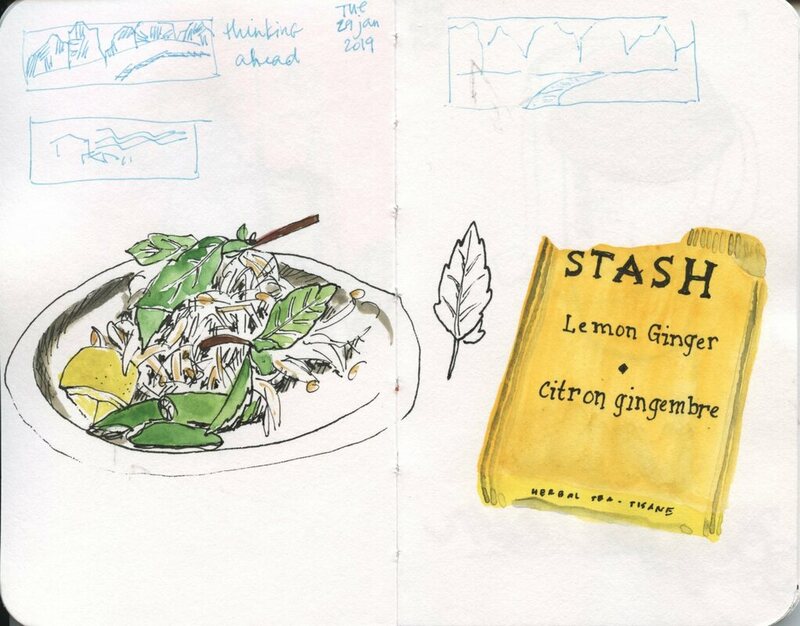 So Liz's article came at a perfect time for me to see that the change is a struggle, but that it's important to mix it up to keep your work fresh and to use your brain and your hands a little differently. My oldest nephew turned 21 and he went to Memphis Made with us for a beer. It was precious! 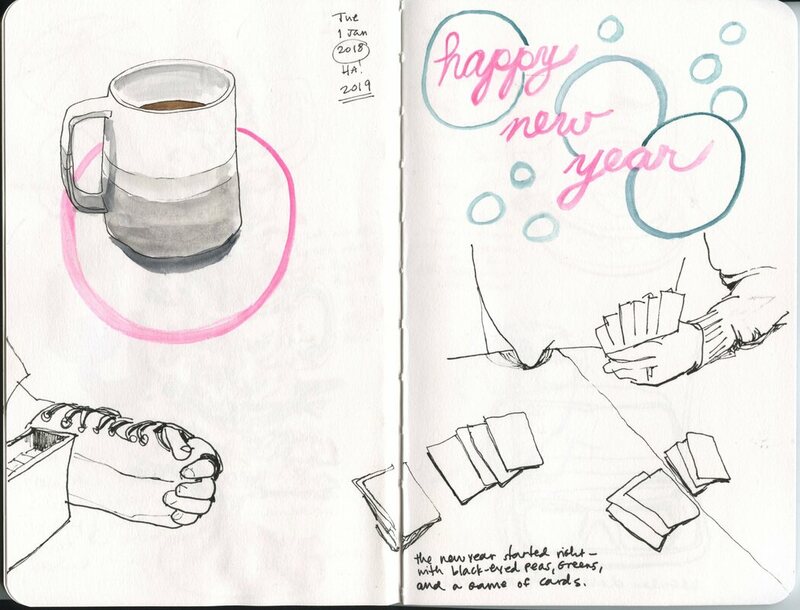 There's a break in my sketchbook from January 19 to January 25 because I was sick with a cold/sinus thing. I wasn't so sick that I couldn't sketch, I wasn't even that sick. I was just. so. tired. And being that tired - not feeling like doing my normal things - made me a little depressed. 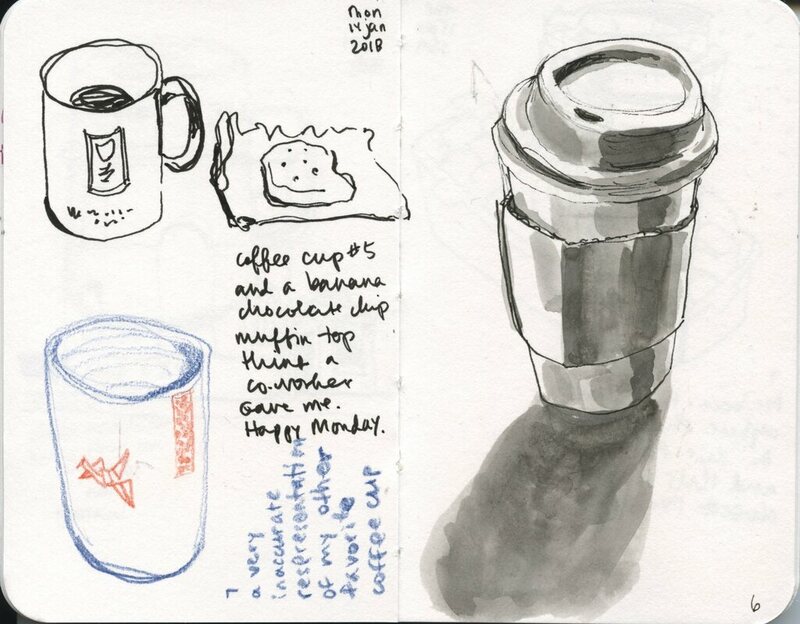 I know that sketching and making art in general makes me feel good and more like myself but I couldn't even make myself sketch a coffee cup, and after a while I realized that I didn't want to bring a thing I love (sketching) into an unhappy place with me. But eventually my energy came back and I picked up my pen again. 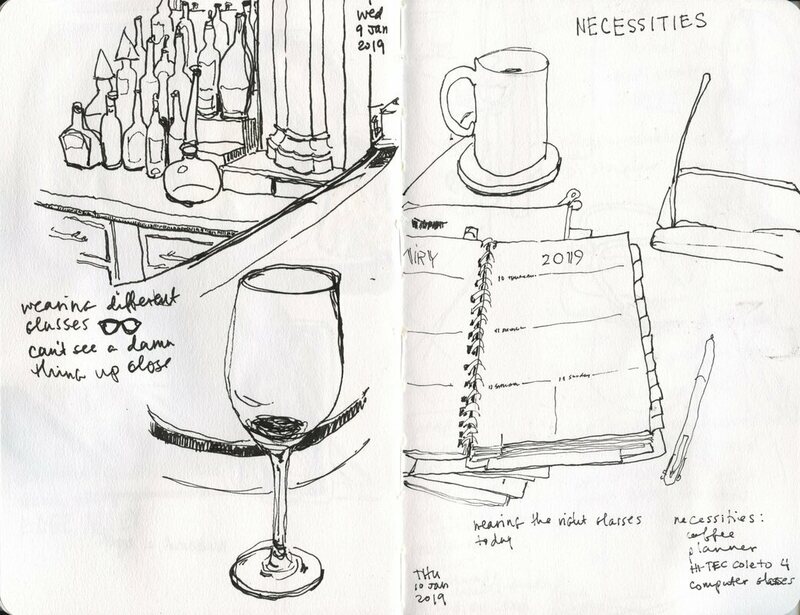 The next time that happens - because there will always be a time I don't feel like sketching - I'm going to try sketching/doodling a pattern, or drawing from a picture. That will ease the pressure, and maybe make me feel better sooner. 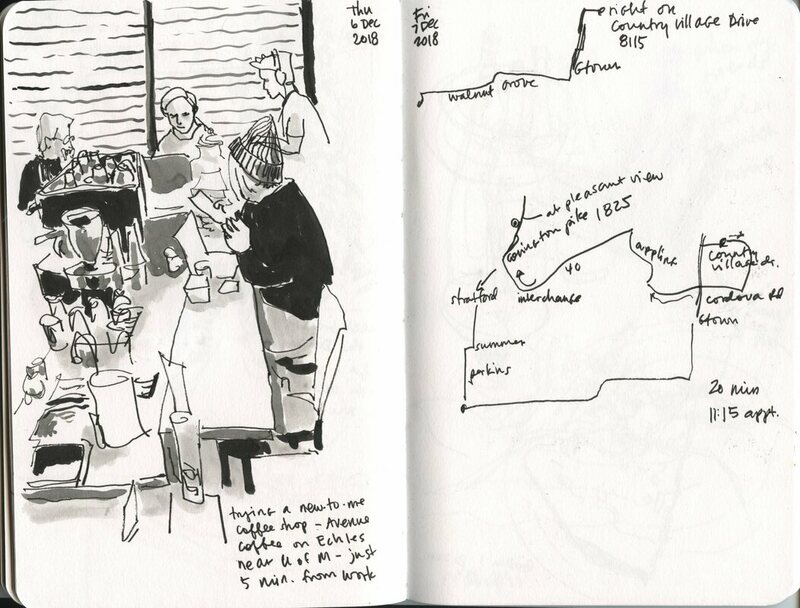 Earlier this month Memphis Urban Sketchers met up at Edge Alley - a great coffee shop/restaurant in the Edge District. It was a great outing - a ton of sketchers joined us, and after what seemed like a lifetime of rain, the sun came out and it was a lovely warm day. 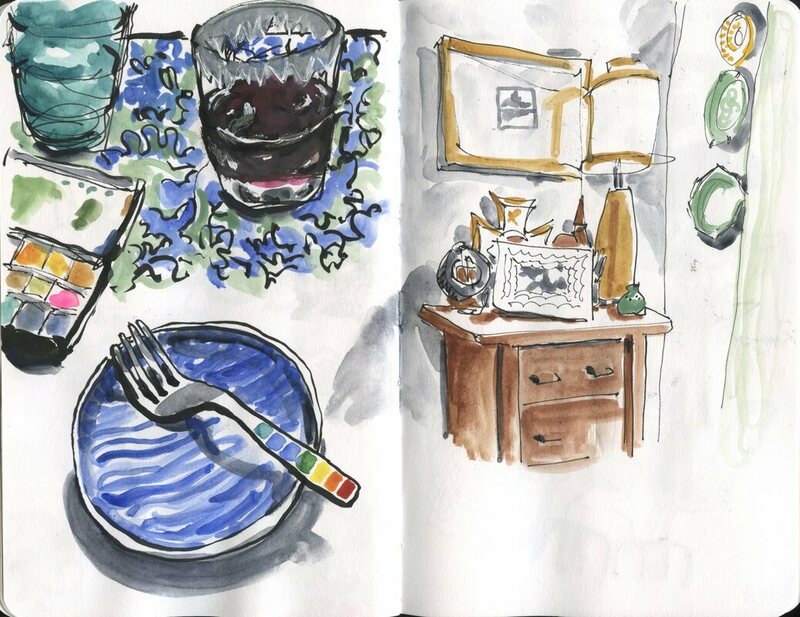 I stayed inside in a sunny spot at the window and ate and sketched a delicious meal. 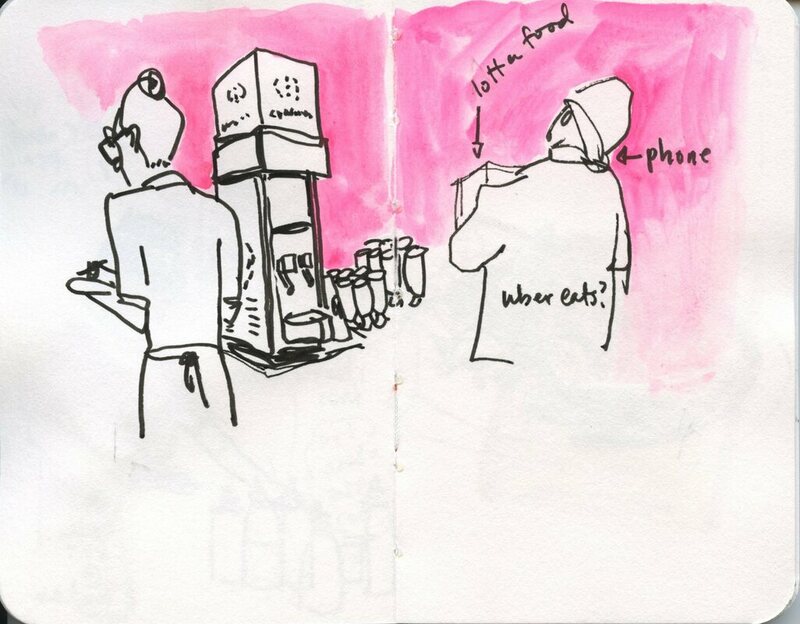 ​We also went to the Edge District in October - here are my sketches from that outing. 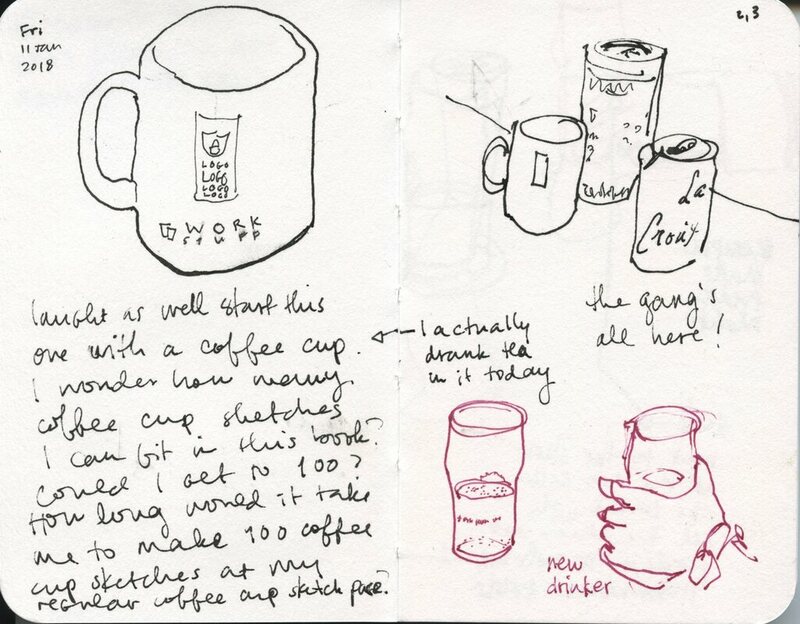 Warm up, thumbnails, and notes on that week's #bythebones diary comics. 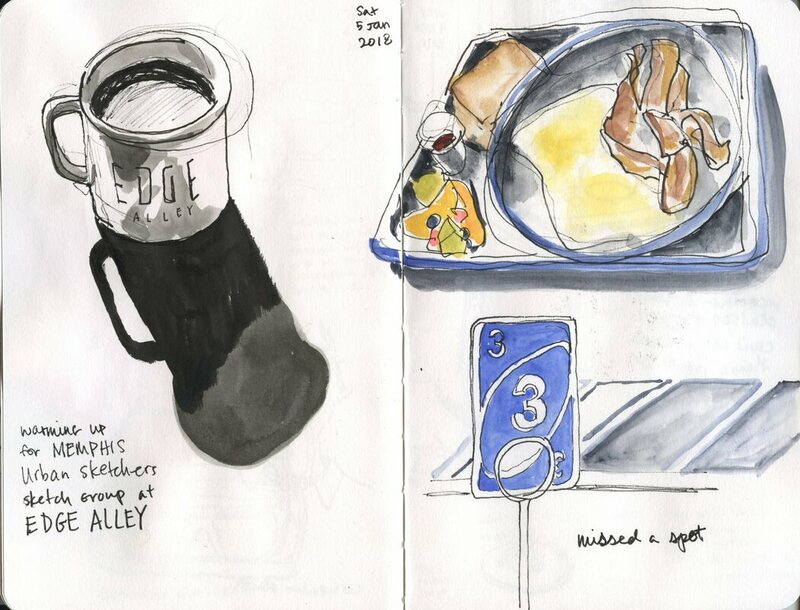 Hope you can join us at our next sketch outing this Saturday, February 2, 10:00 AM at The South Main Market (food hall), 409 S. Main (at Huling). 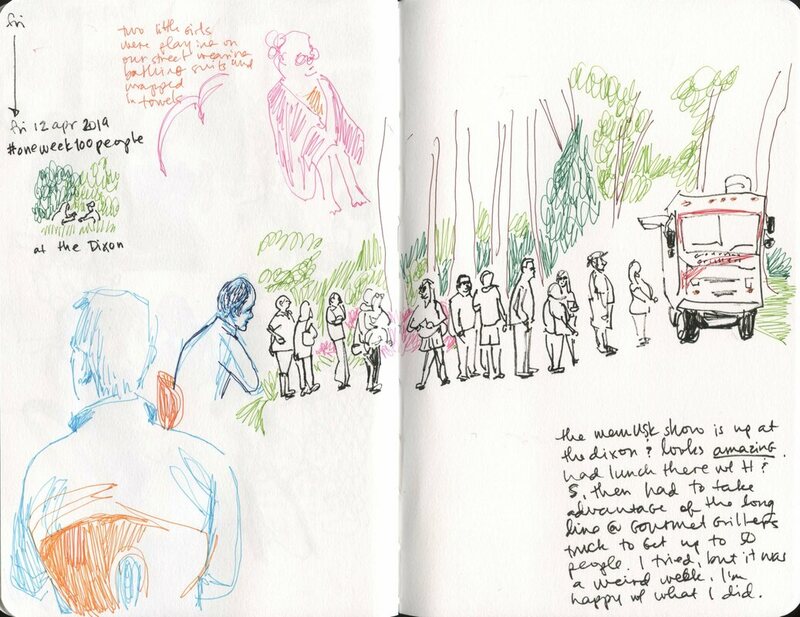 When I scanned in those last two sketches I was surprised by how many sketchbook pages I had not scanned yet. 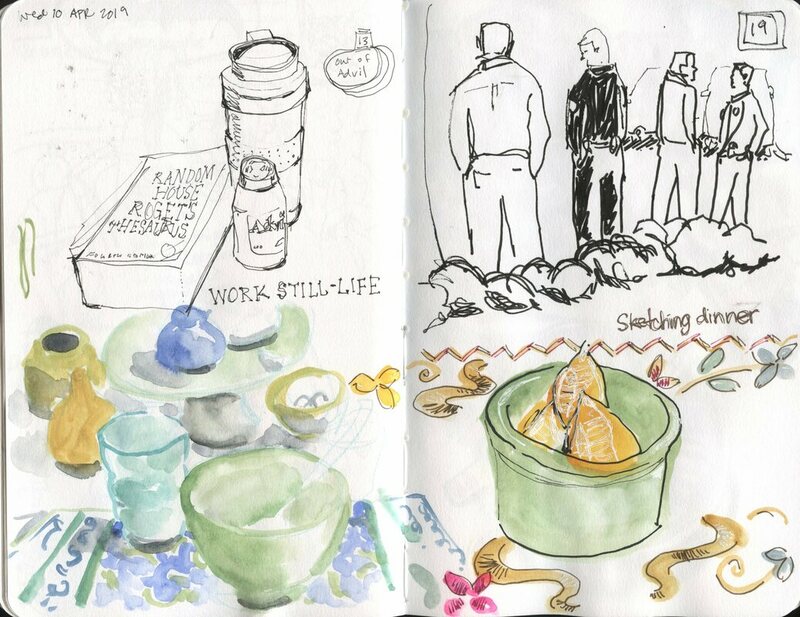 I did more sketching in December than I realized! 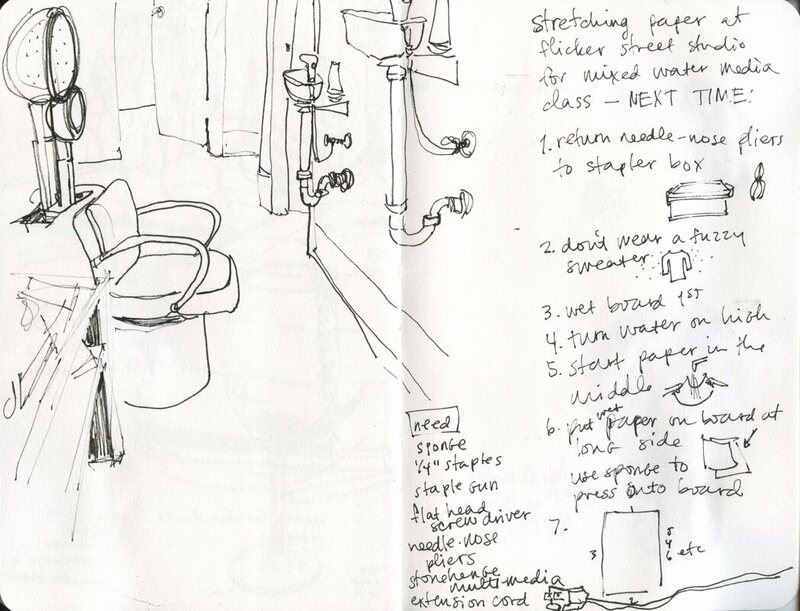 These are mostly quick sketches of everyday things and places interspersed with maps and notes. Just keeping track of my days! 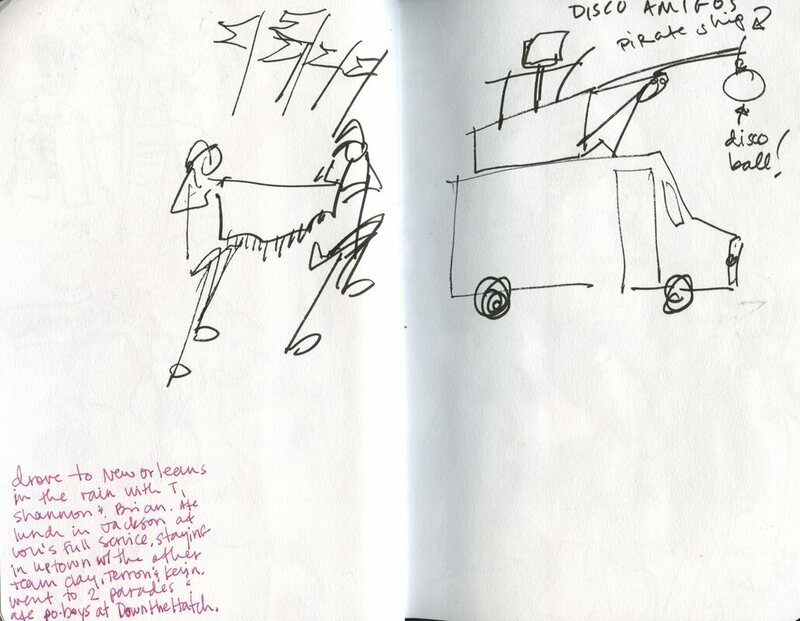 Click Read More below - there are nine more sketches! Okay, just one more acknowledgement of the social construct that is the new year. 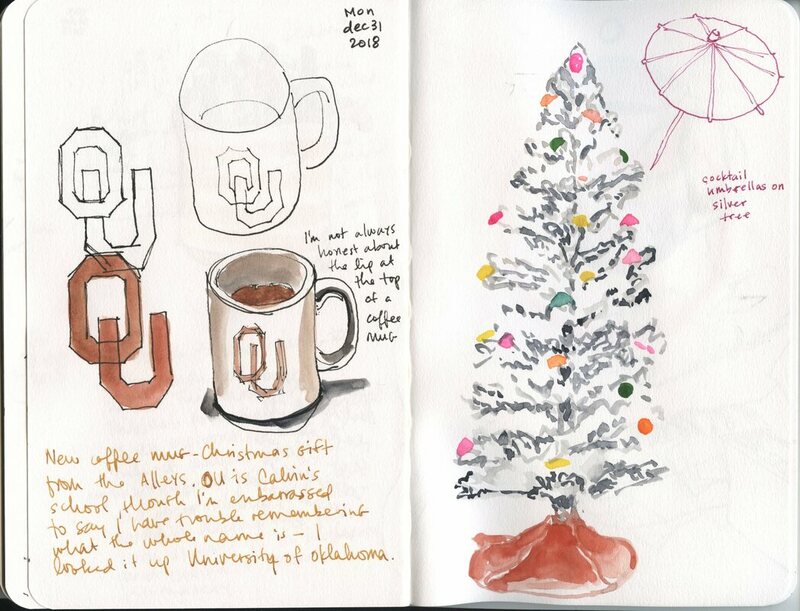 I worked at home on Monday, but took time to study my new coffee mug and to document my Christmas tree before taking it down. Tuesday was a lovely New Year's Day! Just relaxed at home all morning, then joined friends for black-eyed peas and a game of cards. Hope you had a lovely day, too!